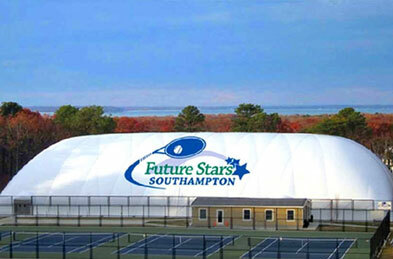 Future Stars Southampton is Suffolk County’s premier year round training facility. FSS features 8 state of the art outdoor tennis courts for Spring , Summer, & Fall outdoor enjoyment, and two inflatable domes for the winter training and camps. Utilizing the same footprint, FSS features 8 state of the art outdoor tennis courts for Spring , Summer, & Fall outdoor enjoyment, then Sept – May erects two inflatable domes featuring Indoor Tennis in one and Indoor Turf Sports (soccer, lacrosse, baseball, football, field hockey etc.) in the other. Future Stars Southampton LLC, which operates the 46,000 square foot, state of the art indoor complex is an affiliate of Future Stars Tennis LLC, one of New York’s largest sports management companies. Conveniently located in North Sea Park, just 2 miles north of the Village of Southampton, at 1370A Majors Path, adjacent to SYS / Southampton Town Rec Center. Hours of operation are 8:00 a.m.-11:00 p.m., seven days a week. We have both hard courts and clay courts, whatever your preference or next tournament might be played on. Victoria Azarenka – worlds #1 Women’s Tennis Player and 1st seed at the 2012 U S Open preferred to practice on the hard courts in preparation for the Open. Our 24,000-square-foot turf field plays host to leagues, tournaments, team practices, classes, clinics, parties and corporate events. Field sports include soccer, lacrosse, football, golf, baseball and field hockey. In addition, the field can be rented out entirely or in sections. The FSS Indoor tennis facility has four championship Har Tru tennis courts with cutting-edge lighting and climate control. Our experienced professional staff offers an extensive selection of clinics and leagues to accommodate players from age three through adults.